A physician will perform a biopsy if he or she determines a skin lesion is consistent with the warning signs of cancer. 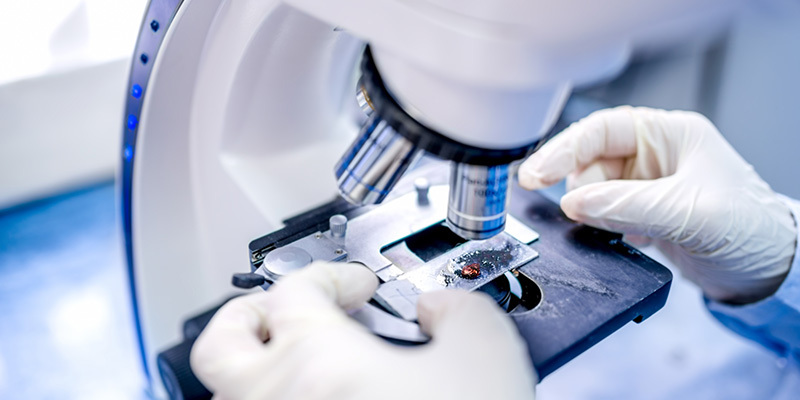 During the biopsy, a sample of tissue is removed for examination to determine if the tissue cells are benign (normal), atypical (abnormal), or cancerous. The specimen is often sent to a lab and examined by a pathologist under a microscope to make this determination. Most biopsies are done under local anesthetic, in the physician's office, at the time of the skin examination. Skin biopsies are typically done in the physician’s office during a regular skin exam. If necessary, numbing medicine may be used to reduce feelings of pain during the procedure. There are several methods a dermatologist may use to obtain a skin biopsy. Shave Biopsy: A "shave" of a thin layer from the top of the suspicious lesion is removed. Punch Biopsy: Using a “punch” instrument, a circular section through all layers of skin is removed. Incisional Biopsy: Using a scalpel, the physician removes a small sample of the lesion. Excisional Biopsy: Using a scalpel, the physician removes the entire suspicious lesion. Curettage Biopsy: Using a curette blade, the physician removes the surface of the suspicious lesion. Fine Needle Aspiration: Used for tumors or lymph nodes deep under the skin, the physician uses a needle to remove cells which are then prepared and examined under a microscope. Sentinel Lymph Node Biopsy: A surgical procedure in which a sentinel lymph node is removed from the body and examined. This helps determine the stage of certain types of cancer, or the extent of metastases (spread). Patients may experience soreness or tenderness at the site of the biopsy for a few days. Results are typically available 3-10 days following the biopsy. Once a diagnosis is made, your physician will recommend an appropriate treatment plan. Has A Recent Biopsy Revealed Skin Cancer? If you have been recently diagnosed with skin cancer, you may have several questions about treatment options. SCARS Center skin cancer specialists can work with you and your dermatologist to ensure you are provided with the best care possible. Contact us today to learn more. SCARS Center is home to some of the most widely used plastic and reconstructive surgeons in Orange County.